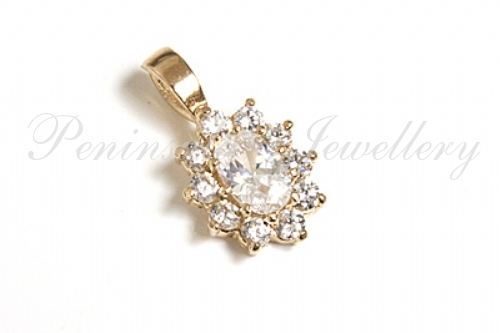 9ct Gold Gem Set Pendants > 9ct Gold Cubic Zirconia cluster Pendant without chain. Stunning cluster pendant, featuring one 6x4mm oval CZ surrounded by 1.5mm brilliant cut Cubic Zirconia stones. Dimensions: 8mm wide, 15mm long, including fixed bail. Made in England. Presented in a luxury gift box – Great Gift! !